View the Continental Divide on this adventure into one of America’s most treasured National Parks. Visit the quaint mountain village of Estes Park and explore the souvenir and artisan shops. Take a short walk to a beautiful waterfall. 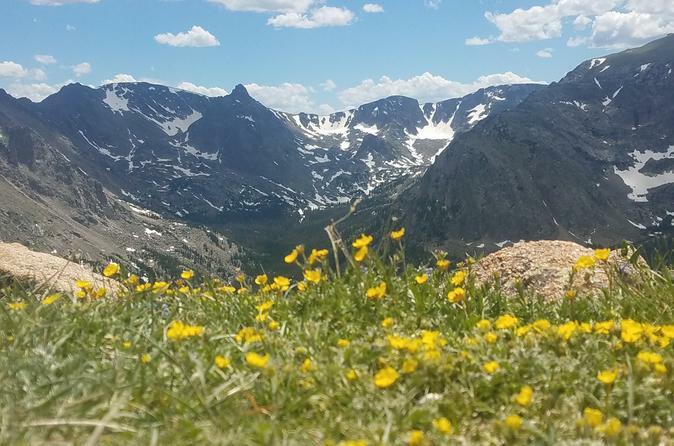 Discover fragile alpine tundra and see incredible rocky mountain views as you travel 11 miles above timberline while reaching an elevation of 12,183 feet on Trail Ridge Road. Enjoy a picnic lunch while surrounded by pristine mountain scenery. Observe a variety of wildlife including herds of grazing elk and yellow-bellied marmots. Stop at the Historic Stanley Hotel if time allows. Your day begins at 8:15am where you will be picked up by your tour guide in a clean, comfortable 12 to 15 passenger Ford Transit touring van from Union Station in beautiful downtown Denver. You will start your tour by driving up to Rocky Mountain National Park through Boulder and Lyons Colorado. Next you will arrive in the quaint mountain village of Estes Park where you can enjoy a stroll through some of the wonderful artisan and souvenir shops, or have an ice-cream or drink at one of the cafes or restaurants. (If afternoon weather is in the forecast you will visit Estes Park at the end of the day.) Once in the National Park (admission included), you will see the many majestic Rocky Mountains. Stop at sheep lake and meadow where we have seen elk or big horn sheep grazing on rich grasses (wildlife viewing likely but not guaranteed). Next you'll head over to Horseshoe Park and witness the destructive force of Mother Nature while taking a short walk around an alluvial fan waterfall. Then, enjoy a delicious picnic lunch in a beautiful valley by a stream. Then you will make your way up Trail Ridge road to see incredible high mountain peaks and expansive park views as you travel for 11 miles above treeline into the tundra. You'll make a stop at the Alpine Visitor Center next to a glacial cirque. Make your way back stopping at beautiful overlooks with breathtaking views. You then return to Denver on a beautiful drive where you will be dropped off back at Union Station where you began your day. Snacks, bottled water, beverages and a picnic lunch are included in the tour. The entire day is approximately 10 hours.